Researchers at Princeton University in Princeton, New Jersey and their colleagues at the Borexino Project have positive detections of geoneutrinos. Antineutrinos generated by radioactive decay within the Earth’s crust and mantle, geoneutrinos are extremely rare and very difficult to detect. The Borexino detector was originally designed to detect solar neutrinos, but scientists on the project soon realized it was ideally placed to search for geoneutrinos as well. Neutrinos are difficult to detect because they typically pass straight through matter and rarely interact with their surroundings in ways we can observe. Detectors must be carefully designed and placed to maximize the chances of interacting with particles. The Borexino detector is a giant stainless steel sphere surrounding a nylon shell containing a thousand tons of a hydrocarbon liquid. The entire sphere is encased inside a larger stainless steel sphere containing an array of photodetectors aimed at the interior sphere surrounded by purified water. The entire detector is buried over a mile underneath the Gran Sasso mountains outside of Rome. The underground installation, built in an abandoned road tunnel, was chosen because the surrounding rock filters out much of the radiation from other sources, increasing the likelihood of real detections. Even so, the detector only finds one or two candidate geoneutrinos each year. The geoneutrino has been elusive and prior claims of detection have been made. 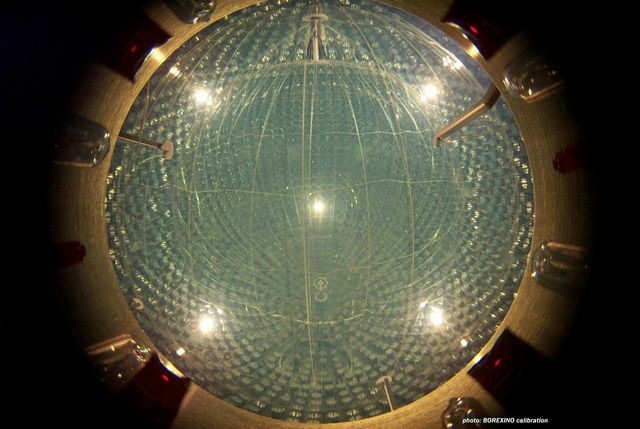 Most notably, a team of scientists from Drexel University claimed to detect geoneutrinos in 2005 using the Japanese KamLAND detector designed to measure neutrinos emitted from nearby nuclear reactors. At this point, both groups reached a high level of confidence that their detections are real, but it is not clear who succeeded in recording real results first. Regardless of which team made the initial discovery, both groups expect the information gathered about the geoneutrinos to provide insight into the physics and structure of the interior of the Earth. In particular, the particles should increase our knowledge of the radioactivity found inside our planet as well as provide insight into subterranean heat sources. Eventually, the geoneutrinos could even help scientists predict volcanic eruptions and perhaps even earthquakes. TFOT has previously reported on other neutrino detectors and neutrino research including research into the mass of neutrinos, Queen Mary’s Particle Physics Research Centre’s examination of neutrino data from the T2K experiment, a new Fermilab detector designed to detect neutrinos as well as other particles, and the construction of the Antares underwater neutrino telescope. Read more about the Borexino Project and its neutrino detector on its Princeton University group page. Read more about the KamLAND detector on its Lawrence Berkeley National Laboratory project page.